The first few years I attended the Maryland Sheep and Wool Festival, I wandered through the sheep barns grinning and touching and yearning for sheep of my own. Once I started my own flock, my visits to those festival sheep barns were more informed, more appreciative, and more like hanging out in a place I belonged. I just love sheep, and there's no two ways about it. At the Festival, you can see sheep of every shape, color and size. People bring their animals from states away to compete for top prizes in their breeds, and against the breed champions of other breeds. Very cool to watch the judging and learn more and more about what makes each breed special. I loved watching this diminutive gal wrestle her sheep, who probably outweighed her by half. 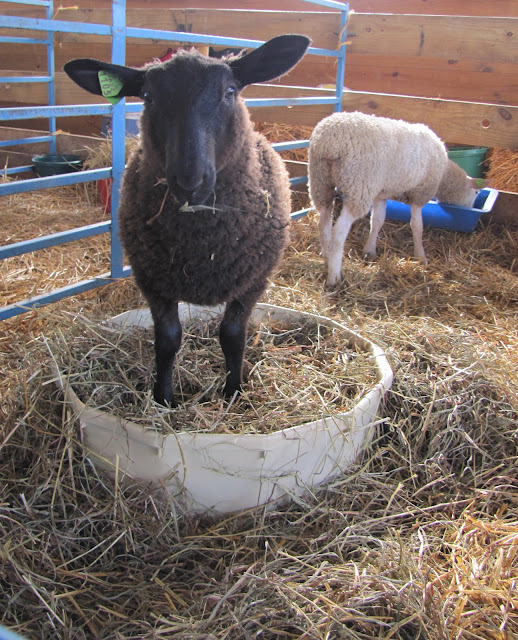 A lamb waiting her turn in the ring. 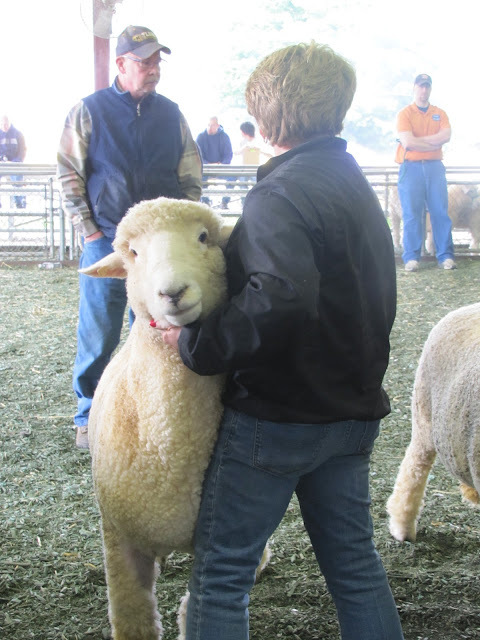 Here's my friend Joanie showing another friend's Jacob ewe. 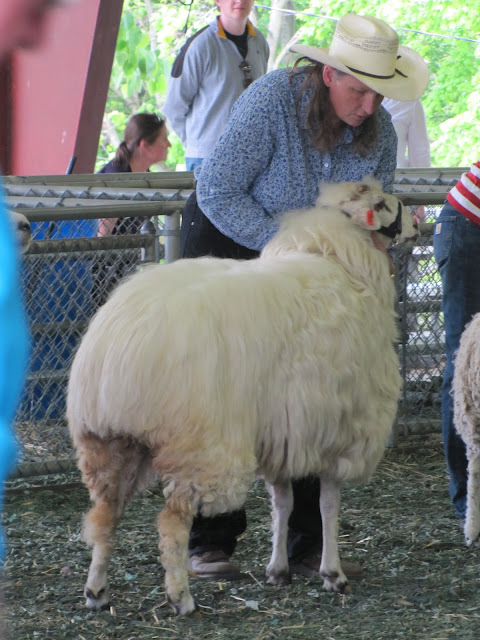 The Jacobs look so tiny next to all these other big showy sheep, it's hard to command much attention from the judges, but Joanie gave it her all. And this is the fleece show. Bags and bags of very nice fleeces are judged, and then auctioned, and then sold. I strolled around there and looked at all the fleeces, but the thought of my living room, back room, and the LRB stuffed with fleeces kept me from even being tempted to bring one home. This time. 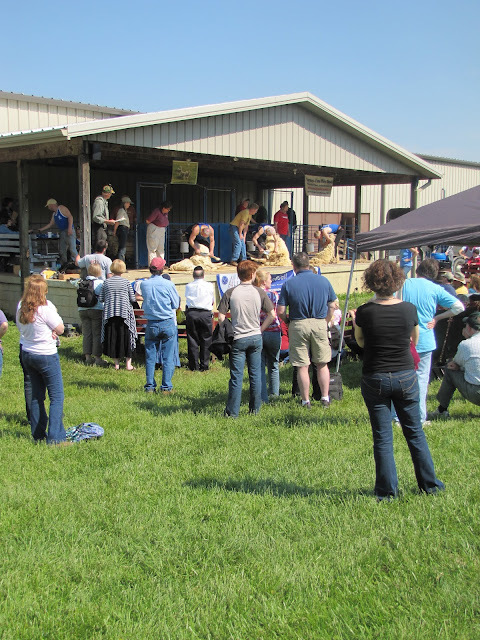 Outside on the stage, the blade shearing competition was going on. This event always draws a big crowd. Sweet Emily was going for the gold. She shears my friend Kelly's sheep in Pennsylvania, and will be shearing Susie Gibbs' sheep again this coming Saturday in Virginia. As we predicted, she wiped up the deck with the five (male) opponents she faced - shearing her sheep faster and more precisely than they did. YAY. EMILY! Her next competition will be in New Zealand!! Besides the spindle meet-ups, the other reason I really had to go to Maryland this year was to attend the third annual FiberCrawl After Party on Saturday night. Podcaster pal Guido Stein has organized this party as a wonderful way for knitters and spinners to get together after a long day of shopping at the festival and just hang out over snacks and drinks. The twist this year was that Storey Publishing picked up a big part of the tab, and used it as a Launch Party for their incredible new book, The Fleece and Fiber Source Book, by Carol Ekarius and Deborah Robson. 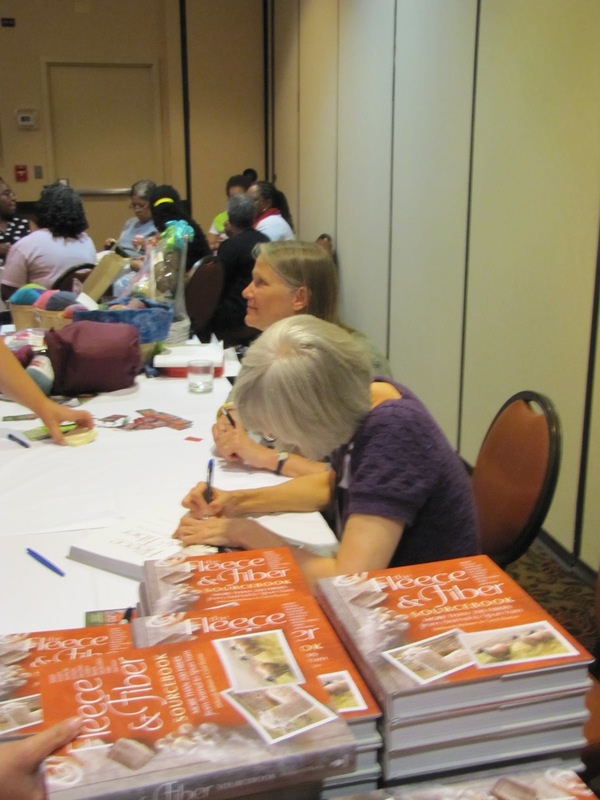 Carol is one of my heroes, as the author of Storey's Guide to Raising Sheep, and regular articles in Hobby Farm Magazine. As a matter of fact, I DID get an autographed copy for my personal library. (Fangirl moment.) This book is a beautiful coffee-table-worthy reference book on every sheep breed you can imagine, with information about the breed's history, current uses, and photos of raw, washed, spun, knitted and woven fiber from each breed. No, I'm not kidding. Ask me to see it next time you're by the farm - it's amazing. As is my custom, I added a CSA share to Guido's collection of door prizes he gives away at the party. Help me welcome Bex to our farm community - the lucky winner, and our newest shareholder for 2012. Yes, Chris, I remember the story. 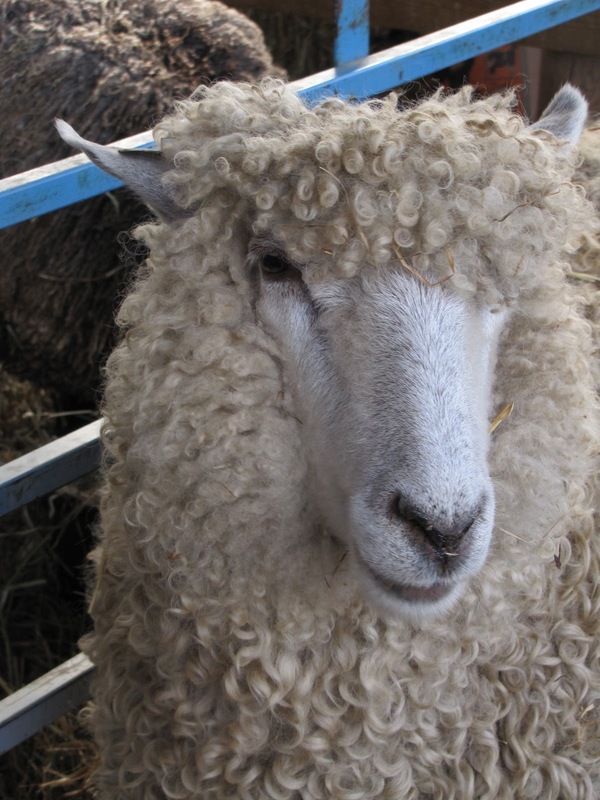 Have you ever gotten that fleece washed? I'd love to go - it's on my bucket list of knitting trips for sure! Thank you for the photo tour.